Western blot analysis of extracts from various cell lines using IL-13RA2/CD213a2 (E7U7B) Rabbit mAb (upper) and β-Actin (D6A8) Rabbit mAb #8457 (lower). As expected, IL-13RA2/CD213a2 protein is not expressed in either U-937 or Daudi cells. 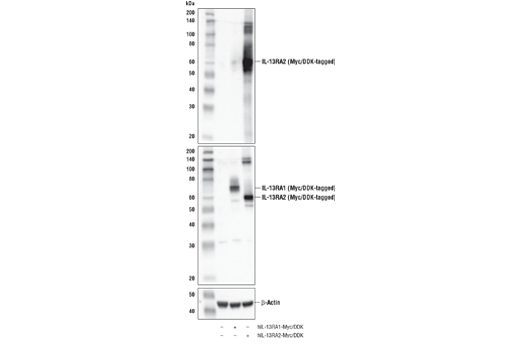 Western blot analysis of extracts from UACC-62 cells, mock transfected (-) or transfected with siRNA targeting human IL-13RA2/CD213a2 (+), using IL-13RA2/CD213a2 (E7U7B) Rabbit mAb (upper) and β-Actin (D6A8) Rabbit mAb #8457 (lower). Western blot analysis of extracts from 293T cells, mock transfected (-) or transfected (+) with constructs expressing Myc/DDK-tagged full-length human IL-13RA2 (hIL-13RA2-Myc/DDK) and Myc/DDK-tagged full-length human IL-13RA1 (hIL-13RA1-Myc/DDK), using IL-13RA2/CD213a2 (E7U7B) Rabbit mAb (upper), DYKDDDDK Tag Antibody #2368 (middle), and β-Actin (D6A8) Rabbit mAb #8457 (lower). 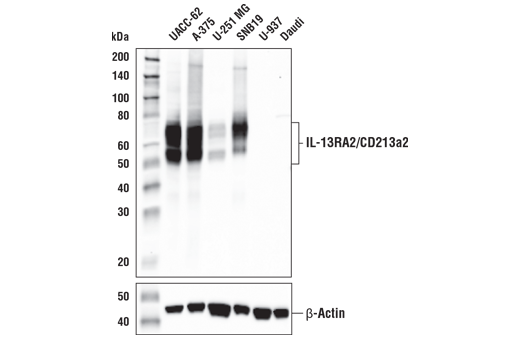 Immunoprecipitation of IL-13RA2/CD213a2 from UACC-62 cell extracts. Lane 1 is 10% input, lane 2 is Rabbit (DA1E) mAb IgG XP® Isotype Control #3900, and lane 3 is IL-13RA2/CD213a2 (E7U7B) Rabbit mAb. 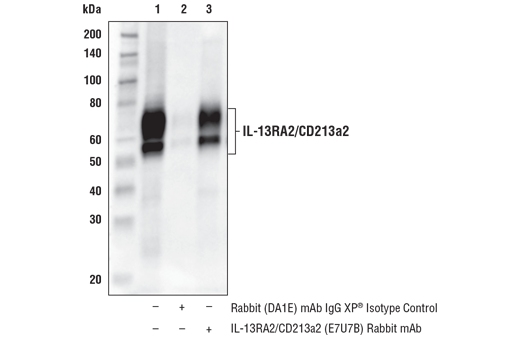 Western blot analysis was performed using IL-13RA2/CD213a2 (E7U7B) Rabbit mAb. Mouse Anti-rabbit IgG (Conformation Specific) (L27A9) mAb (HRP Conjugate) #5127 was used for detection to avoid cross-reactivity with IgG. Flow cytometric analysis of U-937 cells (blue) and UACC-62 cells (green) using IL-13RA2/CD213a2 (E7U7B) Rabbit mAb (solid lines) or a concentration-matched Rabbit (DA1E) mAb IgG XP® Isotype Control #3900 (dashed lines). Anti-rabbit IgG (H+L), F(ab')2 Fragment (Alexa Fluor® 488 Conjugate) #4412 was used as a secondary antibody. Resuspend cells briefly in 0.5-1 ml PBS. Add formaldehyde to obtain a final concentration of 4% formaldehyde. Resuspend cells in fluorochrome-conjugated secondary antibody at the recommended dilution. Incubate for 30 minutes at room temperature. 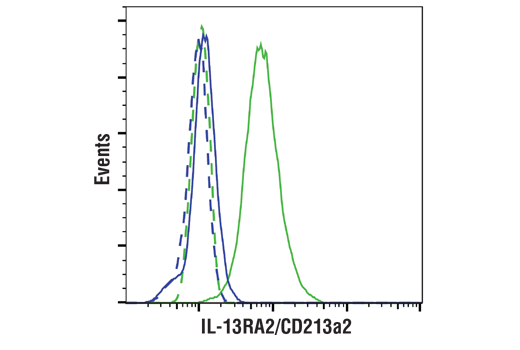 IL-13RA2/CD213a2 (E7U7B) Rabbit mAb recognizes endogenous levels of total IL-13RA2/CD213a2 protein. 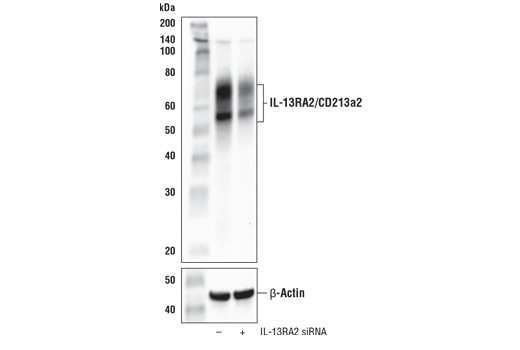 This antibody does not cross-react with IL-13RA1 protein. Monoclonal antibody is produced by immunizing animals with a synthetic peptide corresponding to residues near the amino terminus of human IL-13RA2/CD213a2 protein. Cancer/testis antigens (CTAs) are a family of more than 100 proteins whose normal expression is largely restricted to immune privileged germ cells of the testis, ovary, and trophoblast cells of the placenta. Although most normal somatic tissues are void of CTA expression, due to epigenetic silencing of gene expression, their expression is upregulated in a wide variety of human solid and liquid tumors (1,2). As such, CTAs have garnered much attention as attractive targets for a variety of immunotherapy-based approaches to selectively attack tumors (3). IL-13 receptor alpha-2 (IL-13RA2/CD213a2) is a type-I monomeric transmembrane glycoprotein and component of the IL-4/IL-13 receptor system. Research studies have shown that IL-13RA2 controls IL-13 signaling by serving as a high affinity decoy receptor for IL-13, but not IL-4, in a variety of cellular contexts (4,5). Some studies, however, have suggested that signaling through IL-13RA2 expressed on immunosuppressive myeloid cells facilitates tumor immune evasion through the production of TGF-β (6,7). IL-13RA2 displays a highly restricted expression pattern in normal human tissues, which positions this receptor as a potentially novel therapeutic target for multiple types of solid tumors (8-10). Indeed, research studies have shown that IL-13RA2 is highly over expressed in glioblastomas (11), which has prompted investigation of different IL-13RA2-directed immunotherapies to treat this cancer (12-14). Caballero, O.L. and Chen, Y.T. (2009) Cancer Sci 100, 2014-21. De Smet, C. et al. (1999) Mol Cell Biol 19, 7327-35. Gjerstorff, M.F. et al. (2015) Oncotarget 6, 15772-87. Yoshikawa, M. et al. (2003) Biochem Biophys Res Commun 312, 1248-55. Bernard, J. et al. (2001) Lab Invest 81, 1223-31. Fichtner-Feigl, S. et al. (2006) Nat Med 12, 99-106. Fichtner-Feigl, S. et al. (2008) Cancer Res 68, 3467-75. Debinski, W. and Gibo, D.M. (2000) Mol Med 6, 440-9. Taguchi, A. et al. (2014) Cancer Res 74, 4694-705. Beard, R.E. et al. (2013) Clin Cancer Res 19, 4941-50. Jarboe, J.S. et al. (2007) Cancer Res 67, 7983-6. Brown, C.E. et al. (2015) Clin Cancer Res 21, 4062-72. Brown, C.E. et al. (2012) Clin Cancer Res 18, 2199-209. Mintz, A. et al. (2008) Cancer Biother Radiopharm 23, 581-9.